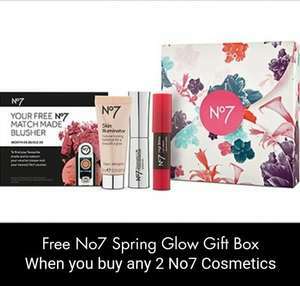 Free Gift when you buy any 2 No.7 makeup products or accessories. I picked mine up instore today and the sales assistant allowed me to use the blusher voucher straight away. I was told you can pick any colour blusher apart from honey which they also have along with the other colours. I picked mine up instore today and the sales assistant allowed me to use … I picked mine up instore today and the sales assistant allowed me to use the blusher voucher straight away. I was told you can pick any colour blusher apart from honey which they also have along with the other colours. If you dont mind me asking... is the crayon lip shine and blusher full size? If you dont mind me asking... is the crayon lip shine and blusher full … If you dont mind me asking... is the crayon lip shine and blusher full size?